Start your journey to a pristinely beautiful piece of land with the arrival at Srinagar Airport where you will be picked by one of our representative who will greet you and help you to get transferred to the pre-booked hotel. Take some rest and then proceed for the sightseeing tour of Srinagar the capital of Kashmir. Visit the Shankracharya Temple, Kheer Bhawani and the iconic Mughal Gardens which are renowned for their magical beauty. In the evening enjoy the shikara ride at magnificently beautiful Dal Lake. Return back to the hotel for dinner and overnight stay. The 2nd day of your budget Kashmir tour package proceed for Pahalgam after breakfast which is around 88 Km from Srinagar and renowned as “Valley of Shepherds”. En-route visit the Saffron Fields, Avantipur ruins which are around 1100 years old and Anantnag Sulphur Springs. 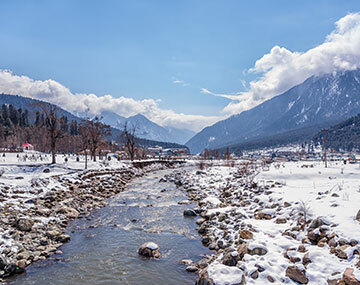 Upon arrival, enjoy your lunch and then explore the splendid attractions of Pahalgam which include Pahalgam Golf Course, Kolahoi Glacier, Tulian Lake, Mamleshwar Temple, Chandanwari and Aru Valley etc. In the evening return back to Srinagar for dinner and overnight stay. After enjoying breakfast proceed for Gulmarg which is around 60 Km from Srinagar. It is about 2,730 meters above the sea level and is affectionately known as “Meadows of Lowers”. After some rest proceed for the sightseeing of Gulmarg which include Gulmarg Golf Course which is counted as the largest 18 hole- golf course of the country. Also, enjoy the gondola ride from Gumrag to Kongdoori and watch the scenic beauty of Gulmarg from the height of 10,000 feet. You can also visit the Strawberry Valley, Seven Springs, Gulmarg Biosphere etc. In the evening return back to Srinagar. Enjoy dinner & overnight in Srinagar at pre-booked houseboat. On the last day of your enthralling and fun-filled Kashmir budget tour package, check-out from the hotel and proceed towards Srinagar airport in time to board a flight for the return journey. Kashmir the northern state of India is renowned for its splendid beauty and charisma that attract visitors from all corners of the world. The panoramic lush meadows, cascading waterfalls, free- flowing rivers, delectable delicacies and rich cultural heritage make it a heaven on earth where you can enjoy an unforgettable holiday experience. If you are looking for a travel partner who helps you in great deal flight bookings, budget friendly hotels and car rentals so that you can enjoy a great vacation with your family then BookOtrip surely won’t disappoint you and help you to select the best. So book your Kashmir Tour Package with us and enjoy the difference. Kashmir, which lies on the peaks of Himalayan Ranges is really gorgeous. The lakes, houseboats and numerous Mughal gardens are definitely worth seeing. Thanks a lot BookOtrip for blossoming my eternal dream come true.